5 bike stands suitable for 10 bikes. 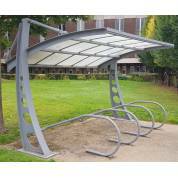 Tubular cycle stand allows the bike to be secured in a variety of ways. There are fixing holes in the bottom bars to enable securing to the floor with bolts.